I love the look of big, branchy arrangements, whether they’re covered with flowers, dripping with crystals or pinned full of photos and well-wishes. For our reception, I created my own branch arrangements and surrounded them with luscious floating peonies and plenty of candles, all for less than $20 per table! (See cost breakdown at the end of the post.) 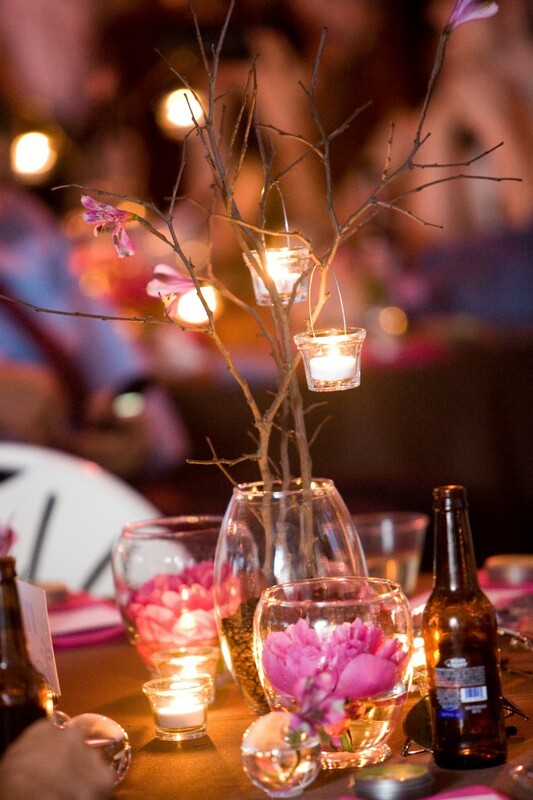 The trick to our centerpieces was the flowers — rather than buying flowering branches that would need arranging on our wedding day, I used alstromeria and brown floral tape on run-of-the-mill sticks. The branches were positioned in advance and, when the big day arrived, my aunt just taped fresh flowers in place. Aside from the branch arrangement, which I’ll discuss in a moment, the centerpieces had two other components: candles and peonies. 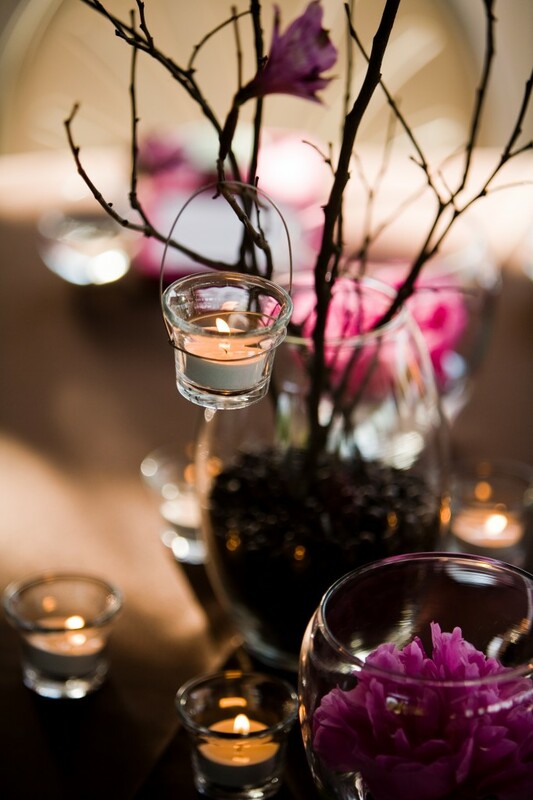 Each table was scattered with tealights. 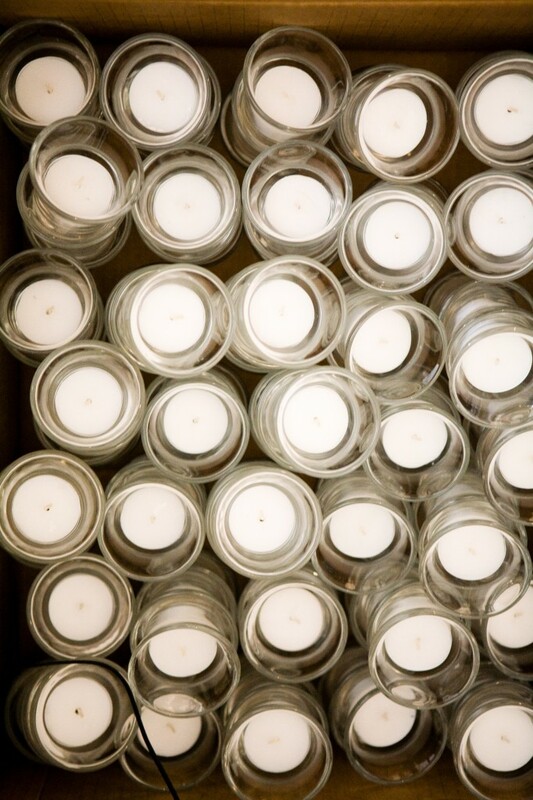 It’s true what they say — always have tons of candles. They’re the easiest, cheapest way to enhance a table and bump up the glamour! 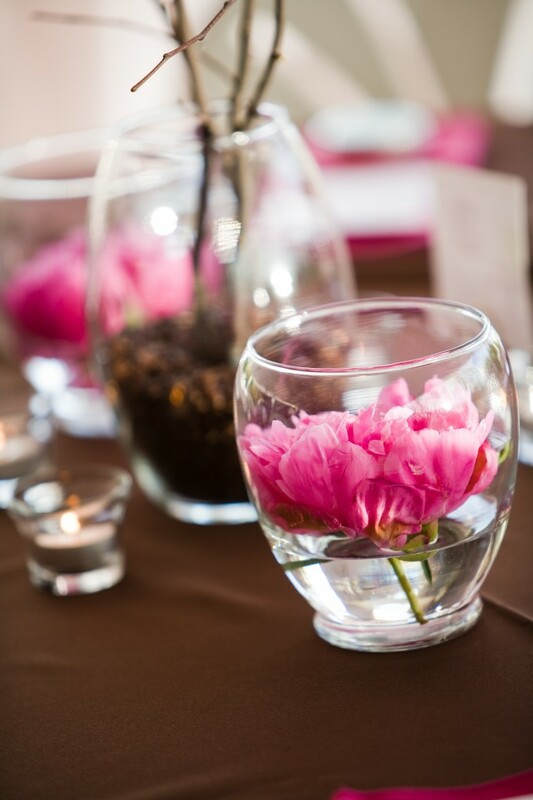 The tables also had two vases with a bit of water and one huge, pink peony. These simple flowers were full of typical wedding drama; the plan was to cut these flowers from my mom’s four huge peony bushes, the ones that are generally bursting in mid-May. Unfortunately, dreary St. Louis weather spoiled that plan and those silly flowers waited to bloom until the day after the wedding! They only opened on Sunday, though, because we had gorgeous, sunny weather on our wedding day, after three weeks of solid gray skies. So I can’t complain (too much)! And we just went with our fallback plan — one week prior to the wedding, as my mom’s flowers ignored our coaxing, we placed an order for dark pink peonies with the florist who was providing our bouts and corsages. Our guests never knew the difference. Finally, the pièce de résistance. In short, to make the branch arrangements, I glued floral foam into the bottom of vases, added three branches, poured in coffee beans, taped on blooms and topped with candles. The branches were fallen pieces of redbud, collected from the trees that line my parents’ neighborhood. I used two or three per vase and trimmed them to clean up the shape a bit. Manzanita branches, distinctive in their twisted, driftwood-like shape, are another popular choice (but good luck finding those in the midwest!). 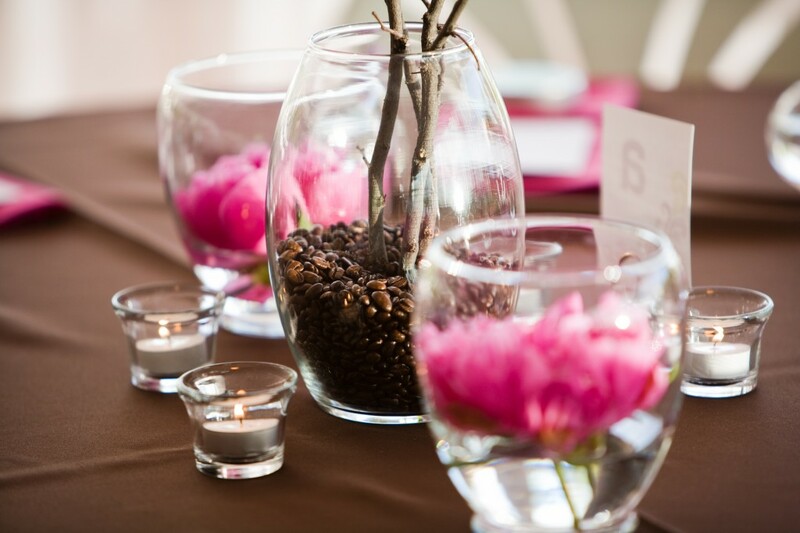 I chose coffee beans as filler for their appropriate color and signature smell, the perfect aroma at a dessert reception. Their awesomeness was increased by their origin — just for our wedding, one of my bridesmaids actually flew back to the States from a service project in Costa Rica and she brought the coffee, a primary export of Costa Rica, with her! 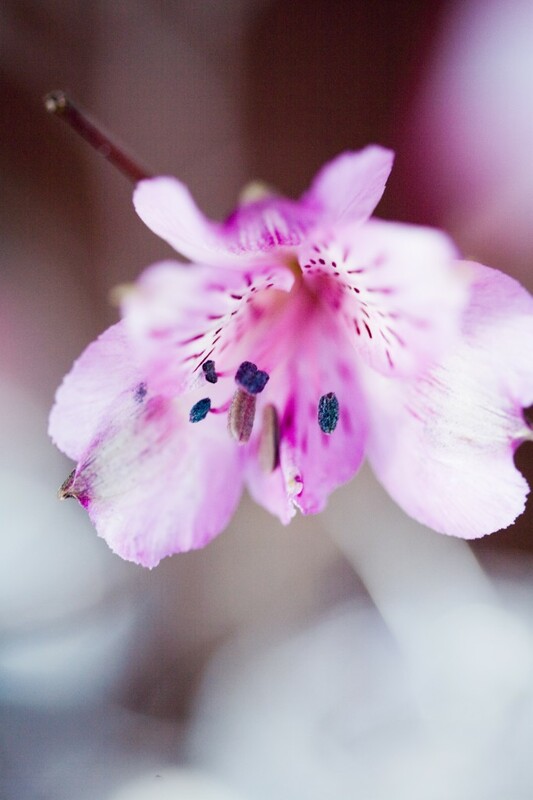 For the blossoms, we chose alstroemeria. Ordered in bulk, they’re a great value; besides using them in the centerpieces, each guest had one at their place setting and we still had flowers to spare. To attach them realistically to the branches, the trick is to cut their stems short and just use a little bit of the brown floral tape. My dad bent the wire hooks to hold the candles in place. Using 18 gauge wire, he wrapped it once around the candle holder, twisted it to secure, then went over the top to form the large hook and twisted to secure the opposite side. I liked to consider myself a DIY bride, but really it was a family (and friends) affair! I’m so grateful for the amazing group of people who helped me and Greg to pull everything off! We also had to factor in glue, wire and floral tape, but those came to less than $1 per table (since the products were split between all 16 centerpieces). 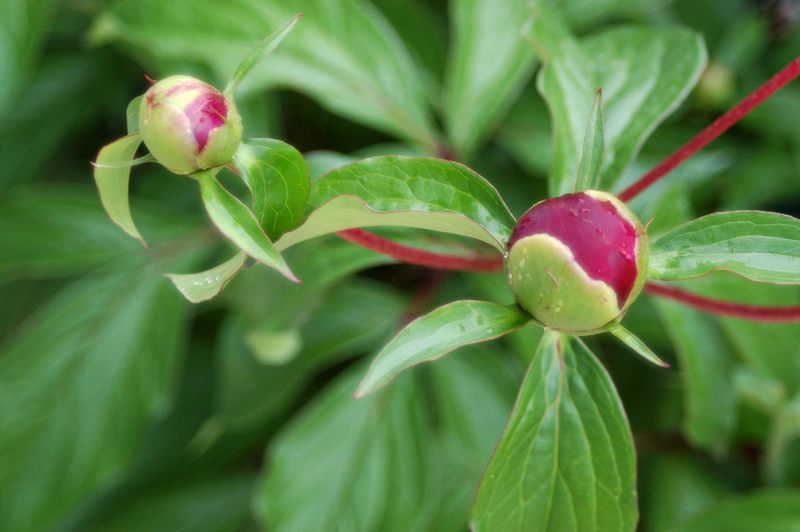 And can you imagine if my mom’s peonies had opened in time? We’d have cut that total down by 1/3! Hard to count on flowers from your own garden blooming when you want them to. This year we would of had some! I just want to say THANK YOU for this candle holder idea!!!!!! I almost ordered 75 hanging candle holders online for $200!!!!!!!!!!!! Then I came across your creative idea…. I have made a few so far and they are PERFECT!!!!!!! Thanks again!!! I’m so glad that I could help!! Good luck with making the rest — I’m sure they’ll be lovely! I was just wondering what height your main vases were? I love this idea also and I have found glass vases for a reasonable price but they are 30 centermeters tall and I didn’t know if this would be too high for the middle of the table if I wanted to put branches in as well??? Mine were about 20 centimeters, but I think they could easily have been taller. 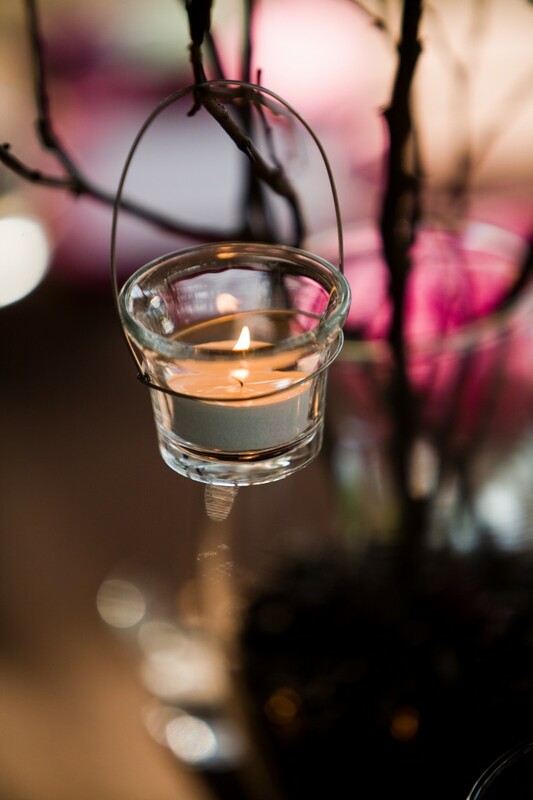 You could always cut the branches a bit shorter, if you make a practice centerpiece and it seems overwhelming! I’m using this everything you did. This is exactly what I want for my wedding next year!! THANKS SO MUCH FOR SHARING!!! And it looks beautiful!